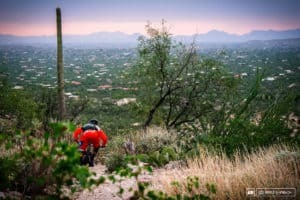 Mt Lemmon trails offer some of the chunkiest, most raw, and ripping fun trails anywhere! True all-mountain riding. This shuttle will pickup at the bottom of the mountain, and drop off at your choice of locations along the 27 miles of trail on the frontside of Mt Lemmon. Access Mt Lemmon originals, like Bug Spring, Milagrosa, and more. Shuttle will depart promptly at 8am from Horsehead/Avenida de Suzenu (bottom of Milagrosa trail).